Announced in august 1936, the alvis speed 25 was a development of the 3.5-litre alvis of the previous year. One of the leading british sports cars of its day, it was praised by land speed record-holder sir malcolm campbell, who described it in deeply flattering terms: a most remarkable car. ... It handles perfectly. . . . the steering is light and responsive. Top speed of 100 mph (est.) engine typedrivetrain: Water-cooled, overhead-valve, 6-cylinder displacement 4,387 cc (4.39 l) power rating 137 hp transmission 4-speed manual chassis: Pressed-steel x-braced; Independent front suspension by transverse leaf springs and radius arms; Rear suspension by quarter-elliptic leaf springs; 4-wheel drum brakes; 3,520 lbs. Speedy sedan designed to rival such cars as the 3.5-litre bentley and the new ss jaguar, the speed 25 was powered by a remarkably smooth six-cylinder power plant derived from the 2,762cc speed 20 engine. The increase in displacement gave the car genuine loomph performance, even with sedan coachwork. 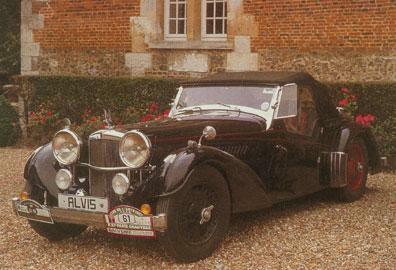 Alongside the speed 25, alvis introduced the 4.3 litre, the largest car built by the firm. special coachwork these sporting alvis cars of the late thirties were most handsome when dressed in short chassis with lightweight coachwork by such great names as vanden plas. In 1938, a 4.3 litre tourer lapped the brooklands race circuit at over 115 mph. The fastest car in its price range, the 4.3 litre performed even better with the addition of a supercharger, a modification made by at least one of its owners. With their distinctive radiators and large headlights, the big alvises of the late thirties were among the most handsome cars of their day.